This Economist Magazine article confirms my personal experience that value investing is in a sea of pain at the moment. The reasons are quite different from the last time (during the dotcom era) when value investing was in the doldrums. This time around, people are not full of euphoria about the prospects of growth stocks -- they are just getting increasingly gloomy of value stocks which seem to be getting cheaper by the minute. Readers of this blog have seen my discussions of various seasonal trades in commodities futures (e.g. see this article). Recently, Mark Hulbert of the NYTimes drew our attention to a seasonal trade in stocks. The strategy is very simple: each month, buy a number of stocks that performed the best in the same month a year earlier, and short the same number of stocks that performed poorest in that month a year earlier. The average annual return is more than 13% before transaction costs, and since it is market neutral, this already considerable return can be leveraged to 2 or 3 times higher. Also, since it turns over the stocks only once a month, transaction costs should not be a major problem. The strategy was developed by Profs. Steven Heston and Ronnie Sadka, and details can be found online here. Besides its simplicity, the strategy is not as affected by survivorship bias in the data set as a mean-reverting strategy, since survivorship bias would tend to lower its backtest performance by excluding very poorly performing stocks that we would short. All in all, it seems to be a market neutral strategy made for retail trading! 1) Quant funds are now becoming the primary market makers in many securities, which normally would provide liquidity and decrease volatility. 2) Unlike ordinary market makers, however, quant funds are highly leveraged. 3) Because of the high leverage, in the face of large losses these market-making quant funds are forced to liquidate their assets instead of buying them, thus behaving in a way opposite to ordinary market makers just when the need for liquidity is direst. 4) Thus quant funds are actually contributing to instability of the market despite their apparent market-making function. Emerging market stocks have been reaching new highs almost everyday (see this article in the Economist magazine), and the natural resource sector has been on a tear as well. Given the giddy valuations of both sectors, which one is a better relative buy at this point? For those of you who have been following the IGE-EEM spread that I proposed before, its value is at an all-time-low these days -- it was at -6.77 standard deviations. Given their historical cointegration, I wouldn't be surprised if it will revert to a more sane value in the near future. Prof. Andrew Lo and Mr. Amir Khandani at MIT recently wrote a paper on "What Happened To The Quants In August 2007?" (Hat tip to my reader Mr. J. Rigg for the article). Most of their conclusions confirm what many observers already suspected: that the loss is likely due to the simultaneous forced liquidation of portfolios holding similar positions by various quantitative funds. What is noteworthy, however, is that they constructed a mean-reversion strategy and observed what happened to it during August. This strategy is very simple: buy the stocks with the worst previous 1-day returns, and short the ones with the best previous 1-day returns. Despite its utter simplicity, this strategy has had great performance since 1995, ignoring transaction costs. 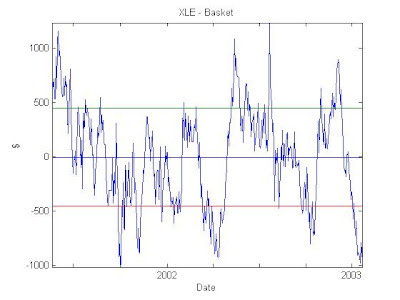 The Sharpe ratio was an astounding 53.87 in 1995, gradually decreasing to 4.47 in 2006. However, the strategy also had a disastrous few days on August 7-9, suffering a cumulative (arithmetic) return of -6.85% in those 3 days. Then on August 10, it rebounded, like the rest of the quant funds, with a return of 5.92%, almost reversing all of its previous losses. 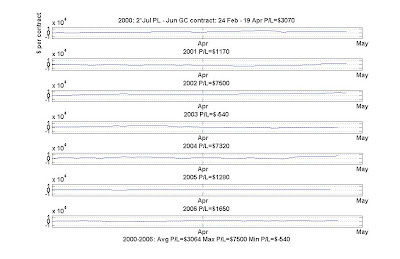 For me, this experiment reveals three interesting points: 1) a simple price factor seems to capture most of the performance of the complex factor models run by the gigantic hedge funds; 2) even technical mean-reverting factors suffer losses, not just momentum (growth) factors based on fundamentals; and 3) if one wants to avoid disasters and enjoy spectacular returns, even a one-day holding period is too long. I haven't done the experiment myself yet, but I bet that if we were to liquidate the portfolio at market close each day, not only would we avoid the loss of -6.85% in those 3 days, but would probably end up with a positive return of a similar magnitude! For readers who are interested in news-driven trading, here is another article. This article pointed out a contrarian view offered by Richard Oldfield, a fund manager, who says “price movements in response to news are exaggerated, providing an opportunity to those who do not base too much on what has happened in the last hour or 24 hours.” [my italics] I am not sure whether Mr. Oldfield's statement is based on any statistical research or not -- as far as I can ascertain, his book "Simple But Not Easy” cannot be purchased anywhere in North America. However, I should point out that this statement is in contradiction to an abundance of research done on Post Earnings Annoucement Drift (PEAD): the phenomenon that stocks with positive earnings news continue to trend up for a long time. Furthermore, if indeed price movements in response to news are exaggerated (contrary to the findings of PEAD), it would seem to suggest a reversal trade rather than suggesting that the news can be ignored! In the same issue of the Economist magazine I cited previously, there is an article about the valuation of currencies based on 13 quantitative models that Morgan Stanley developed. They found that the most overvalued currency (against the US dollar) is the New Zealand dollar, while the most undervalued currency is the Japanese Yen. What about the Chinese Yuan that arouses much hoopla in Congress? The models found it to be almost exactly fairly valued. There is an article about algorithmic trading in the latest issue of the Economist magazine, where it says that one-third of all stock trades in the US are due to algorithmic trading. This should not surprise us. What is more interesting is its mention of the electronically tagged news products that are coming out of Dow Jones and Reuters, which purportedly enable computers to buy or sell stocks immediately upon the release of a news item. The data suppliers regard these news products as some kind of secret high-tech weapons: "Dow Jones claims the business is so secretive that it cannot divulge details of customers." Is this hype justified? Actually, to get a taste of news-driven trading, you don't need to pay a hefty fee to buy one of these products. You can just monitor the regularly scheduled economic news release (consumer confidence, new homes sales, crude inventories, etc. ), trade the relevant futures, and proceed to make millions. The fact that most of us who monitor these economic news releases haven't yet made our millions is an indication whether these news products will help you do the same. The information contained in the news is often difficult to interpret. Even the initial price reaction to the news may be wrong, leading to swift reversal after an apparent initial trend. And finally, what's wrong with scanning for sudden price movemenets, and then check for possible news to confirm that the price movement is due to the release of new information? I have discussed in various articles trading the spreads between pairs of ETF’s, or between a basket of stocks against an ETF using cointegration technique. There is, however, a glaring omission, as I haven’t yet mentioned the classic statistical arbitrage strategy: pair-trading stocks. The average annual excess return in 2005-now is about 7.7% (on one-side of capital), and the Sharpe ratio is 0.8. Since I have applied the technique on only one industry group, diversification is limited and therefore the Sharpe ratio is low. For the interested readers, they can attempt to apply this technique to more industry groups and perhaps generate a higher Sharpe ratio. Even with just one industry group, this trading strategy may be a good complement to a portfolio heavy on trend-following strategies and therefore require a reversal model to smooth out the returns. I have started a model portfolio in my subscription area to demonstrate this strategy which will be updated daily around 3pm ET. Other details of the strategy will be detailed in an accompanying article there as well. Here is an interesting and thoughtful article, with reference to an academic study, on how terrorism affects forex trading. Normalized return on assets based on cash flow. By "normalized", I mean we need to standardize the numbers with respect to the industry median. To Prof. Mohanram's credit, he claims only that these factors will generate returns after 1 or 2 years, not the short-term returns that many traders expect factor models to deliver. The excess annual return based on buying the group of stocks with the highest score and shorting the group with the lowest score is a good 21.4%. Not only does the combined score generate good returns, but each individual factor also delivers good correlation with future returns, proving that the performance is not due to some questionable alchemy of mixing the factors. For example, it makes good intuitive sense that extra spending on R&D and advertising will boost future earnings for growth stocks. Interestingly, Prof. Mohanram pointed out that most of the out-performance of the high-score stocks occur around earnings announcements. Hence for those investors who don't like holding a long-short portfolio for a full year, they can just trade during earnings season. One caveat of this research is that it was based on 1979-99 data (at least for the preprint version that I read). As many traders have found out, strategies that work spectacularly in the 90's don't necessarily work in the last few years. At the very least, the returns are usually greatly diminished. In the future, I hope to perform my own research to see whether this strategy is still holding up with the latest data. The Economist magazine has given us a fundamental reason to buy platinum (if not to short gold), in addition to my seasonal one. Yesterday was the exit of the Australian dollar futures seasonal trade which I discussed in my premium content. It incurred a loss of $920 per contract, despite a 12-year winning streak previously. This may be the peril of a trade that is not based on any fundamental rationale that I know of, as well as an in-sample bias that I alluded to in my previous article. I will keep it on my watchlist for another year. By the way, due to a technical glitch, my previous article on seasonality in commodities futures was not sent to many subscribers, so here is the link. Are claims of seasonality in commodity futures markets "fraudulent "?
" The Commodity Futures Trading Commission (CFTC) warns consumers to be alert to possible fraudulent claims that they can profit on commodity futures or options trading as a result of changes in the prices of physical commodities based on seasonal weather patterns or other well-known events." "Futures and options markets adjust very quickly to news events and announcements, and by the time salesmen come calling, the opportunity to profit from such news is gone." Whoa, this certainly got my attention! Since I am not a journalist, I don't normally go around challenging claims made by the United States government. But if this statement, which is basically the efficient market hypothesis, is generally true, then all of us traders should just pack up and go home. Now whether or not the efficient market hypothesis is true is subject to much academic debate. But is it right for the government to state definitively that this hypothesis is true, and that all claims otherwise are "fraudulent"? Political arguments aside, I think that the commodities market may have more arbitrage opportunities (i.e. less efficient) than the stock market. Perhaps this is because there are more participants in the commodities markets that are not speculators, particularly for "consumption" commodities such as oil and gas. This is not to say that every seasonal pattern that we have backtested is necessarily going to repeat itself. Many of these patterns occur only once a year, and there are just so many years that we can use for our backtest, and needless to say, most of them are "in-sample". My practice is to paper-trade the pattern for at least one year going forward as an "out-of-sample" test, especially if the pattern is not supported by a strong fundamental rationale (like the Australian dollar trade that I talked about in my premium content area.) Furthermore, by publishing my backtest results on this blog, any future repeat of the pattern can indeed be regarded as out-of-sample, increasing our confidence in them. My own interest in researching seasonality in commodities market was (hopefully) not piqued by the kind of snake-oil salesman that CFTC warns us about. About a year or so ago, I attended a talk given by Dr. David Eliezer at Columbia University's Financial Engineering seminar. The topic is "Structure and Behavior of Commodities Markets" in which he outlined various seasonal patterns that persist in the futures markets. Dr. Eliezer was formerly the chief quantitative researcher at Goldman Sachs' commodities group. Given this academic respectability, I certainly feel emboldened to enter into the debate! Due to a technical glitch, many subscribers to this blog were not notified of my latest article on stop-loss strategy and a method to estimate optimal holding period for mean-reverting strategies. So here is the permanent link again. What is your stop loss strategy? A reader recently asked me whether setting a stop loss for a trading strategy is a good idea. I am a big fan of setting stop loss, but there are certainly myriad views on this. One of my former bosses didn't believe in stop loss: his argument is that the market does not care about your personal entry price, so your stop price may be somebody else’s entry point. So stop loss, to him, is irrational. Since he is running a portfolio with hundreds of positions, he doesn’t regard preserving capital in just one or a few specific positions to be important. Of course, if you are an individual trader with fewer than a hundred positions, preservation of capital becomes a lot more important, and so does stop loss. Even if you are highly diversified and preservation of capital in specific positions is not important, are there situations where stop loss is rational? I certainly think that applies to trend-following strategies. Whenever you incur a big loss when you have a trend-following position, it ususally means that the latest entry signal is opposite to your original entry signal. In this case, better admit your mistake, close your position, and maybe even enter into the opposite side. (Sometimes I wish our politicians think this way.) On the other hand, if you employ a mean-reverting strategy, and instead of reverting, the market sticks to its original direction and causes you to lose money, does it mean you are wrong? Not necessarily: you could simply be too early. Indeed, many traders in this case will double up their position, since the latest entry signal in this case is in the same direction as the original one. This raises a question though: if incurring a big loss is not a good enough reason to surrender to the market, how would you ever decide if your mean-reverting model is wrong? Here I propose a stop loss criterion that looks at another dimension: time. These numbers do confirm my experience that the GDX-GLD spread is the best one for traders, as it reverts the fastest, while the XLE-CL spread is the most trying. If we arbitrarily decide that we will exit a spread once we have held it for 3 times the half-life, we have to hold the XLE-CL spread almost a calendar year before giving up. (Note that the half-life count only trading days.) And indeed, while I have entered and exited (profitably) the GDX-GLD spread several times since last summer, I am holding the XLE - QM (substituting QM for CL) spread for the 104th day! A reader JR just posted some very thoughtful comments on my article on factor models. You can read his comments and my reply here. Let me describe a portfolio optimization scheme that, over the long run, is supposedly guaranteed to outperform the best stock in the portfolio. Before we begin, let’s agree that we will rebalance our portfolio every day so that each stock has a fixed percent allocation of capital, just as your favorite financial consultant would have advised you. What this means is that if you own IBM and MSFT, and IBM went up after one day whereas MSFT went down, you should sell some IBM and use the capital to buy some more MSFT. There is a technical term for such portfolios: they are called “constant rebalanced portfolios”. Notice also the similarity with the Kelly criterion which I wrote about before: Kelly criterion asks you to maintain a constant leverage, which is like maintaining a fixed percent allocation between cash (debt) and stock. But what should the fixed percent allocation be? Here is where the scheme gets interesting. Suppose we start with an equal capital allocation, for lack of any better choice. At the end of the day, your portfolio has a certain net worth. But then you can calculate what the net worth would have turned out if you had started with a different allocation. Indeed, we can run this simulation: try all possible initial allocations, and calculate the hypothetical net worth of the resulting portfolio. Use these hypothetical net worth as weights (after normalizing them by the sum of all net worth), and compute a weighted-average percent allocation. Finally, adopt this weighted average allocation as the new desired allocation and rebalance the portfolio accordingly. So actually the “fixed” percent allocation is not fixed after-all: it gets adjusted daily, but probably not by much. Repeat this process everyday, always calculating a new weighted allocation by simulating various initial allocations since day 1. This scheme of portfolio optimization can be proven to produce a net worth greater than just holding the best stock, given long enough time. If this sounds like a miracle, it is partly because this is in fact an ingenious result of information theory, and partly because there are various caveats that actually limit its practical application. The proof that it works (at least in theory) is rather technical and I will let the interested reader peruse the original paper published by Prof. Thomas Cover, a noted information theorist from Stanford University. He coined the term “Universal Portfolios” for portfolios rebalanced/optimized with this scheme. Without understanding the mathematical intuition, this scheme may appeal to those who believe in long-term trending behavior of stocks, because if a stock performs very well in the past, we will end up allocating more capital to it in the long run. It may also appeal to those who believe in short-term mean reversal behavior, since in the short-term, we are performing daily rebalancing of the stock positions based on an approximately constant allocation. However, this seeming confirmation of either trending or mean-reverting characteristics of stock prices is illusory – this scheme is supposed to work even if the stock prices are totally random! How can we manage to squeeze out a gain even with random price series? 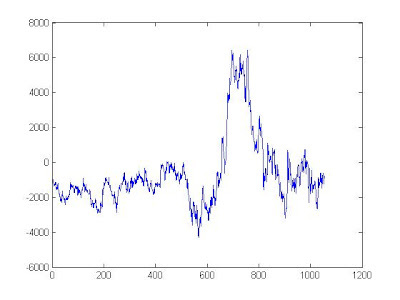 Remember that we have done the opposite before (see my earlier articles): we manage to lose money even when a price series exhibits a geometric random walk. So it is not too surprising that we can also make money using similar information theoretic juggling. Now for the caveats. Every time an information theorist start saying “In the long run, …”, you will be well-advised to ask: How long? 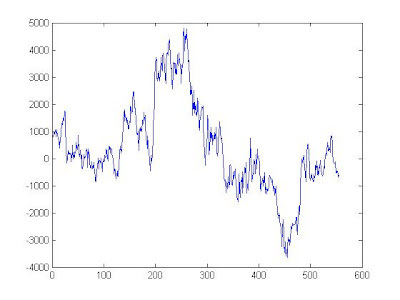 In my geometric random walk example where the volatility (standard deviation) of returns every period is 1%, we find that the compounded rate of return is an agonizingly small -0.005% per period. In the case of the universal portfolio scheme, the out-performance over the best stock in the portfolio is similarly dependent on the volatilities of the stocks: the higher the volatility, the faster the out-performance. Let me run a simulation with a portfolio consisting of two ETF’s RTH and OIH. If we were to run the Universal Portfolio scheme from 2001/5/17 – 2006/12/29, I find that the cumulative return is 32% (without transaction cost). Contrast that with just buying-and-holding the best ETF (namely OIH here): the cumulative return is 54%. The Universal Portfolio loses. Does this mean the theory is wrong? Not really: RTH and OIH may just have too low volatility. Herein lies the first practical caveat with the Universal Portfolio scheme: it can take too long to realize its benefit if the volatility is low. How do we find ETF’s that have high enough volatility to realize the out-performance of Universal Portfolio? Actually, we can simply boost the volatility of RTH and OIH artificially by increasing their leverage. So let’s say we leverage both of them 2x. This means their daily returns and volatilities are both doubled. Now the best ETF (which is still OIH here) has a return of 23% (why is it lower than the un-leveraged case? Remember the formula m-s2/2 in my previous article.) , but the Universal Portfolio has a return of 45%. So now the Universal Portfolio wins. But this is a Pyrrhic victory: if you factor in a transaction cost of 10 basis points, the Universal Portfolio scheme actually returns only 4%. This is the second caveat of Universal Portfolios: because of the frequent rebalancing required, transaction costs tend to eat up all the out-performance. Now there is a final caveat. The reader may ask why I don’t just pick two stocks instead of two ETF’s to illustrate this scheme. Aren’t most stocks more volatile than ETF’s and therefore much better suited for this scheme? Indeed, most academic papers, including Prof. Cover’s original paper, use a pair of stocks for illustration. But if we do that, we run the risk of introducing survivorship bias. Naturally, if you know ahead of time that none of these two stocks will go bankrupt, the Universal Portfolio scheme may look great. But if you run a simulation where one of the stocks suddenly went bankrupt one day (which tend to be a fairly mathematically discontinuous affair), the Universal Portfolio scheme will most likely not beat holding just the non-bankrupt stock in the beginning. Using ETF’s eliminated this problem. But then ETF’s are far less volatile. So given all these caveats, is Universal Portfolio really practical? Prof. Cover seems to think so. That’s why he has started a hedge fund to prove it.